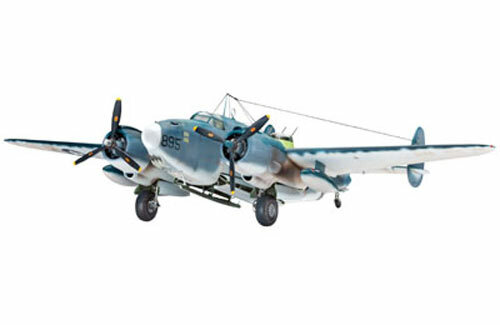 All Products > "04662 Revell 1/48 Pv1 Ventura"
The twin-engined Ventura was used during the second World War II for long-range maritime and anti-submarine patrols. 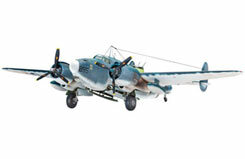 It was originally developed to satisfy the requirements of the Royal Air Force. Extensive modifications led to the Ventura II which, designated PV-1 found great interest within the U.S. Navy. It was also the first U.S. bomber to have all metal-sheet covered control surfaces. The two R 2800-31 Double Wasp engines each delivered an output of 2023 bhp. The flight characteristics were comparable to those of a fighter aircraft. The Ventura proved to be extremely successful on operations with the U.S. Navy, which covered an area from Alaska to the Japanese mainland and south to the Caroline Islands off the coast of Australia. Fitted with up to seven 12.7 mm calibre machine guns it had an enormous concentrated fire power and could attain a top speed of over 500 km/h. In addition to maritime reconnaissance and anti-submarine warfare the PV-1 Ventura was also used as a bomber, photo reconnaissance and night fighter aircraft. Between December 1942 and the end of production in May 1944, 1600 aircraft were built and delivered to the US Navy.